In the May 2017 issue of The Highland Woodturner, Curtis Turner answers a question many new woodturners ask – what types of turning tools should I buy? My students often ask what type of tools they should buy. Specifically, should they buy inexpensive tools or go straight for the expensive ones? I think this question deserves a bit of discussion and does not have a single best answer that fits everyone, but this does not mean one should sink into analysis paralysis. 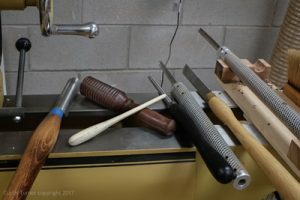 Click to read Curtis’s thoughts on the tools a woodturner should purchase for their own woodturning shop.